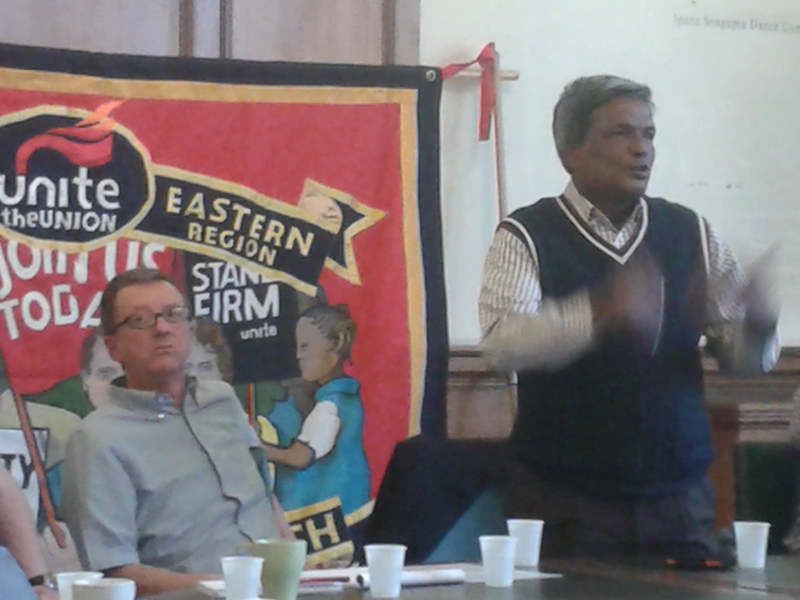 On the 7th April, Unite's community centre at Cable Street hosted a visit by a representative of the Bangladeshi Garment Workers Federation (BGWF), which is continuing to fight for the rights of garment workers after the collapse of the Rana Plaza factory killed more than a thousand workers and injured another 2,500. The employer wasn't even able to confirm at the time how many had been in the building. "Just a day before the collapse, the building was briefly evacuated when cracks appeared in the walls. However, workers were later allowed back in or told to return by the factory owners." The blatant disregard by factory owners for the welfare of their staff is just one reason that the BGWF is continuing to fight for workers' rights in Bangladesh. Their representative, Amin, spoke eloquently of the unsafe conditions within the factory at the time, and how little has changed in the two years since, despite the tragedy. Apart from health and safety problems, workers are still forced to work 12-14 hours per day, sometimes seven days per week. Inevitably, factory owners are hostile to any attempt by the unions to organise, nonetheless the BGWF is making inroads. Speaking about the tragedy, he said that the factory owners, employers' federation, and government all bore a share of responsibility for the deaths and injuries suffered, but that big companies like M&S, Primark, H&M and others are also to blame, for failing to ensure that workers' needs are protected when they commission goods from the factories. But Amin pointed out that consumer power can have an impact and urged the audience to use this to pressurise such companies, demanding that they introduce worker rights and safety conditions into their contracts. Often, the factories have just one client, and consumer pressure can therefore make all the difference. Labour Behind the Label campaigns for garment workers' rights and explains how everyone can make a difference. Read more on the Rana Plaza disaster here, and about the Bangladeshi Garment Workers Federation here.